Often, I read a book quickly, eager for the plot to unfold, excited to see how it turns out, and ready to meet the characters. 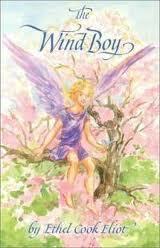 But The Wind Boy was written in slower times, and is best read in that state of mind. It’s a book to slow down and savor. I’m re-reading the book again now, to fully appreciate the imagery and writing that Ms. Eliot offers readers. This unusual book defies categories. It isn’t fantasy, the way most people understand fantasy. The closest word I can use to describe it is mystical. There is something very true about the book, and if children and adults let it enter them, that truth will be felt, without any words. The truth that it presents is that there is a deeper, more beautiful world, perfectly parallel to ours, and we see it in our moments of happiness and joy, and especially in our moments of artistic creativity. In fact, I know of no other children’s book that points out the truth of the creative process–our creations are not our own, they come to us from elsewhere, when we are quiet enough to let them enter us. And yet, for all these high ideas, The Wind Boy is a perfect children’s book. It doesn’t preach, it doesn’t lecture, it simply lets the higher world unfold. One of the striking elements of the book is how Eliot specifically distinguishes the ‘clear world’ that the children enter, from ‘magic.’ This is such an important contribution, because often spiritual and mystical experiences degenerate into magical thinking. Even when young children have experiences of fairies and other realms, we tend to describe it to them in terms of magic, which means it’s not real. Here’s a book that says, yes, the other realms are real, when we have our hearts and minds open to them. A wonderful book for all ages, and great as a read-aloud. Cynics, beware, this is not for you!! PS: I thought this book was out of print, but in fact, it is still being printed by a very small, high-quality press called River Rocks Press in Ohio. I think it would be great to get the books directly from them. To go straight to the publisher, email John at jmrrpress at gmail.com. Amazon now seems to carry it again.